This Comexim bra is absolutely gorgeous. This was my second order from Comexim and I was pretty excited to get it because I also decided to get the matching briefs. 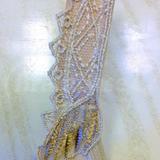 The color of the lace is a subtle black-brown with brownish-red on top of a cream base. 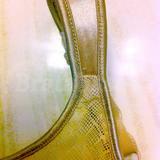 The cream fabric underneath the lace has a matte finish. I tried to get photos of the bra in natural light so you could see how lovely it is when the light hits it. The cut of the Geisha is very much like the other Comexim "plunge" styles I have. Unlike plunges in other brands, the cups feel very supportive and my breasts feel very enclosed, like they're not going anywhere. The gore comes up slightly higher than most plunge style bras. It is similar to Ewa Michalak's S line. The cups are nice and deep: if you are looking for a narrow cup that offers good projection, then this is the bra for you. The tops of the cup encase the breast tissue up there without cutting into the tissue. The underwires don't stab me in the underarm. Actually, if they were ANY lower, they would be too low. The placement of the straps is also ideal for my shoulders. This is a comfortable bra with a nice firm band. It stretches to just about 31" so I don't know if that is quite true to size. I wouldn't say the band is super-stretchy because the lace pattern extends to the band area (which is a nice touch). I'd say the Comexim Magic Blue's band is slightly stretchier.